The FIRSTS in our lives always leave a lasting impression. 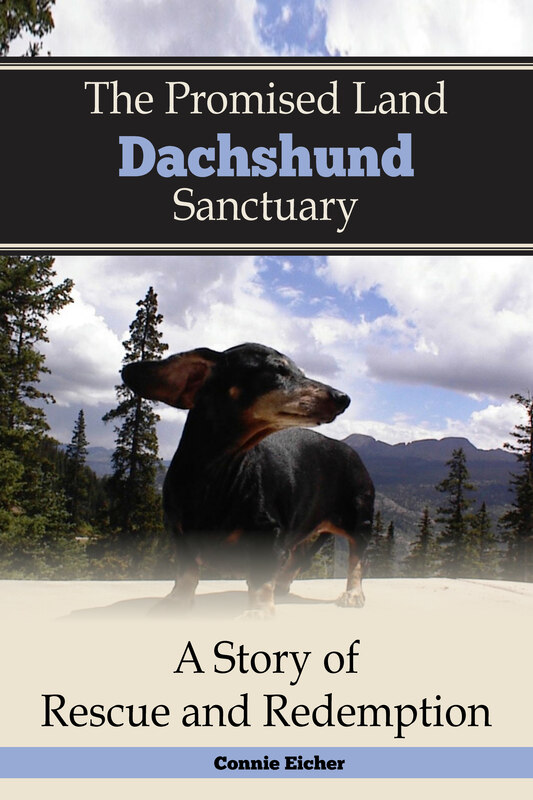 Andre’ was our first official rescue for The Promised Land Dachshund Sanctuary. He came to us from a local kill shelter in July of 2001. They picked him up off the streets. The large picture here is how he looked that first day. Sad eyes, dull coat, skinny and scared. But Andre’ soon flourished into a handsome, friendly, funny leader. He was gorgeous. His coat turned to a rich glossy red, and his face and body filled out with muscle and attitude. He loved to be silly and Rick adored that about him. You can see them in action in that second photo with Andre’s collar around his ears. He knew he made us laugh and it gave him great joy. As our population at the sanctuary grew, Andre’ recruited several friends to join his “Rat Pack”. He instigated the fun as you can see in the middle picture and everyone followed his lead. They wrestled and played for hours each day, and never grew tired of the friendship they forged. Andre’ outlived his “Rat Pack” to watch over 250 dogs come through our doors. His wisdom and his leadership touched each of these precious souls, and no one doubted his spot as the Alpha Male. As the years passed Andre’ enjoyed excellent health. He suffered some back issues in his sixth year but crate rest helped him heal and soon he was leading the charge in the yard once again. The years turned his coat to gray, and his step lost its bounce, but Andre’ retained the seniority that he earned at the sanctuary during his fifteen years here with us. This last week Andre’ took a turn for the worse and it became apparent that his time with us grew short. Doc Jess (our wonderful Vet) said his kidneys were failing him and we began to try to convince our hearts that we would soon have to say our goodbyes to our sweet little man. Last night at 2:30, Andre’ crossed the rainbow bridge and took a huge piece of our heart and our history with him. We shall always remember him as not only our first, but our Alpha. He taught us the joy of watching our little ones flourish and regain their self-esteem and their joy. We will always love you Andre’! And we will never forget! RIP our precious little heart! Your “Rat Pack” awaits you at the bridge. This is Levi. He came out of a local kill shelter years ago. His eye was horribly swollen and his tail was hanging by a few strips of skin. He had obviously been hit by a car. But his vet work went well and he lived for many happy years here at the sanctuary. We rescued Levi in 2003. At that time there was almost no possibility of special needs dogs finding an adoptive home. Seniors were impossible to place. Almost no one was interested in taking in a dog that would need extra vet care. The other rescuers in our state and all across the south were in a horrible spot when they rescued a senior or special needs dog because they knew it would most likely be a permanent foster for them. This took up a spot that could be used over and over again to rescue healthy young dogs that could be placed in permanent homes. So the sanctuary took in lots of dogs from other rescuers. They would take one or more of the healthy dogs we had rescued in exchange for us taking a senior or special needs dog from them. I remember so many times sitting in the waiting room of the vet clinic with a blind and deaf dog, or a dog missing a limb, or a dog with one, two, or three devastating ailments. People would ask me why I would spend so much time and money on an ill or disabled dog when I could rescue and re-home several healthy dogs for the same money. My answer was always the same. Their lives matter too!! We have always loved every animal that ever stepped foot on our land. They all received the very best we had to offer, and unfortunately sometimes that was not enough. But we had to try! Don’t misunderstand my meaning here. Every rescue group I have ever dealt with wanted desperately to help ALL the dogs they came across in need. But the financial and practical reality of the situation was that when a senior or special need dog came into their care, it prohibited them from rescuing many healthy dogs. Hard choices had to be make. And many rescuers took in those senior and special needs dogs anyway. But when we opened our doors and gave them the option to rescue those babies and not lose a foster home for several years or longer, they were as thrilled as we were. Today, there are many sanctuaries and groups that specialize in seniors. And I’m sure there are some that take in special needs. But back in the day when we first started we were breaking new ground, in our area anyway. Everyday I have conversations with people that love the senior dogs. Many people now have disabled dogs as well. But that is a new face for rescue that was not the case back in 2001 when we first opened our doors. What a thrill that is for everyone that loves these precious babies!!! One of the most frequent comments made about our sanctuary is that it must be heaven. And most of the time it truly is. Our little guys love each other as much as we love them, and that is our definition of heaven. I must admit that on occasion we get a bit overwhelmed with the work. It takes quite a bit to take care of thirty+ dogs, especially when many are seniors or special needs babies. Fifteen of our dogs live in our home with access to the yards through doggie doors. Another group of ten live on the back porch that we enclosed years ago. We have two dogs that live at the barn, and six large dogs that are split between two yard areas out back. We also care for and love four rabbits, two cats, six horses, and one ground squirrel. Feeding and filling water bowls is always first on the agenda in the morning. Typically this takes a little over an hour and a half. Then morning meds must be handed out, and anyone that wasn’t feeling well the previous day gets a once over. As our morning hours begin to disappear we try to sneak in some cleaning of the yards, brushing the dogs that need it, and making sure each dog gets handled and loved on. After lunch we run errands, wash dishes, sweep and mop floors, and on occasion I even do a little dusting. There is always laundry and cooking to do when I can squeeze it in. I make at least three or four trips to the vet clinic each month. Rick hauls and stores approximately twelve hundred pounds of dog food, horse grain, rabbit pellets, and cat food each month. In between all this I am now trying to keep a Facebook page updated and write this blog. Rick works part time in his welding business, and works to keep the tractor, the vehicles, and everything else mechanical running. Because the majority of our dogs are seniors or special needs, grief enters into our world all too often. I have held quite a few little ones while we fulfill our most difficult but perhaps most important task of ending their pain. Rick buries each of our babies wrapped in their own blanket, while the tears pour down his face. But there is not a lot of time to wallow in that grief as the babies we still have need us. The evening hours bring some relief from the hurried pace of our days. We often sit together in the yard and watch the little guys run and play. Rick wrestles and crawls around on the ground with the dogs while I hold the ill, the recovering, or the emotionally needy dogs in my lap. Our lifestyle is not for everyone, not even for everyone who loves dogs, because the price is high. Thankfully, the rewards are even higher. We go to bed each night exhausted but extremely grateful for each day in our own little slice of heaven. One More Little Treat Can Hurt! We have all had it drilled into our heads over the years the dangers of letting ourselves get too heavy. But how much do we know about the perils of letting our dogs get overweight? Dachshund owners don’t have to be told about the risk of IVDD (Intervertebral Disk Disease), Some studies show that overweight dogs increase their risk of serious joint complications by 29%! Arthritis and hip dysphasia are also common in overweight dogs. Muscles, tendons, and ligaments can also be deteriorated prematurely due to the stress of carrying extra weight. The anterior crucial element ligament in a dog’s knees is very prone to strains or tears. This can not only be extremely painful for the dog, but it often requires an expensive surgery to repair. Many other ailments can be traced back to a few extra pounds on a small dog. One of the most common effects of obesity in dogs is diabetes. Being overweight causes the body to produce more insulin to accommodate the extra body tissue. Eventually the body needs more insulin than it can produce and the result is diabetes. Life expectancy of a diabetic dog is on average just three years. The list of other life threatening ailments made worse by allowing your dog to become overweight is long and frightening. Heart disease, high blood pressure, difficulty breathing, decreased stamina, heat intolerance, decreased liver function, increased surgical and anesthetic risks, digestive disorders, decreased immune function, skin and hair problems, increased risk of cancer, and decreased quality and length of life is more than enough to cause us “doggie parents” to have nightmares. We have rescued several senior, obese dogs over the years. A few of them lost their life-long families because their weight made them cranky and they struck out at a toddler. Others came to our sanctuary with severe back problems and decreased ability to exercise to reduce their weight. So it becomes a vicious cycle. They get fat and ill, they get grumpy or mean, they don’t want to move around, their vet care expenses go through the roof, and they find themselves in a situation that not only threatens their lives, but threatens their connections to their families. I’ve had people tell me over the years that their dog won’t eat dog food. They feel forced to feed a dog from their table, and the dog suffers drastically. My experience with dogs is that their instinct to survive will force them to eat at some point. If an overweight dog doesn’t like the dog food you offer them, it will not hurt them to fast for a day or two as long as they are still hydrating. We have, of course, made accommodations for senior dogs, dogs with infected teeth, or malnourished dogs. These dogs may need some creative answers to get their nutrition. It is not beyond me to scramble eggs or feed baby food to a dog in these situations. But these are exceptions to the rule. Our responsibilities to our dogs are comprehensive. We are the ones that determine what they eat, how much they eat, and how much exercise and medical care they get. All dog owners have felt the pain of losing a dog they loved. Our grief is often complicated with thoughts of “What else could I have done for this beloved member of my family?” Often the answer to that question is there is nothing else you could have done. But if your dog is overweight, if you can’t see a waistline on your dog from the top view, or if your dog shows signs of some of the illnesses caused from or complicated by being a little too plump, now is the time to take action. A dog on a diet doesn’t really understand that it is getting less food. You can still give your dog a treat everyday, just break it into smaller pieces. They still feel they got the treat, you still feel like you are spoiling them, and they consume less calories. Most dogs would be thrilled with a little extra exercise in the form of added walks with Mom or Dad, toys that produce added activity, a dip in the pool for some fun water aerobics, etc. You know your dog, and you know what kind of activities it will participate in. The answer to an obese dog is not a simple, fast solution. But the benefits to the dog, to you, and the entire family from reversing a dangerous trend of weigh gain, are more than worth the effort. Author thepromisedlanddachshundsanctuaryPosted on May 11, 2016 2 Comments on One More Little Treat Can Hurt! These seniors ladies have all been part of our Red Hat Society here at the sanctuary over the years. They had a habit of lying together on the porch in the afternoon hours so they could watch over the pack playing in the yard. They intervened in the play if it got too rough, and they comforted the newcomers as they learned the lay of the land here at the sanctuary. I felt it was a fitting tribute to Mother’s Day to salute these old gals. Many of the dogs we have taken in over the years have been seniors, and they have lost life-long families. They grieve that loss just as we would if we suddenly lost our family and the home we had known for our entire lives. Most of them come to us frightened and on the verge of giving up on their lives. But we discovered years ago how much comfort a large “family” of dogs can be to each other. Newcomers who try to isolate themselves are prodded and encouraged by the other dogs to join the activities in the yard. Most find it difficult to ignore 30+ dogs wandering around them playing, barking, and enjoying their lives. Our long term residents have seen so many new dogs come through our door that they instinctively know what the next new dog needs. Several of our senior ladies make it their custom to curl up beside scared dogs, and often those frightened new babies can soon be seen wandering around the yard with one or two of our most loving dogs by their side. The “pack” soon becomes the new family, and they comfort these lost souls past their grief and into a new life. Rick and I have compared this dynamic to a child attending a new school. How wonderful it is when they begin to make new friends. They lose the fear of being alone, and they gain the confidence of knowing they are now part of a loving family that is always going to be there for them. No matter what we are able to do for these little guys, they can do so much more for each other. Our pack can teach a new dog everything they need to know to enjoy their new lives here at the sanctuary. They teach devotion, acceptance, discipline, and the security of belonging again. All these things can only be taught by the dogs, and we have been blessed to watch this dynamic in action over and over again. Rick and I can tend to the basics of survival, and we can certainly help them learn that their new “human” family will always love them. But it’s our dogs that teach them to accept joy back into their hearts, and for that we are eternally grateful! What if this week never ends? Barking, barking, and more barking. The dogs would bark, and we would say, “How high?” We trudged through morning chores, with permanent looks of misery upon our faces, and counted the minutes until we could escape to a more peaceful seclusion without the constant hounding of the hounds. This quiet reverie would be short-lived, as the mutts wait on no one. They all needed exercise, and medicine had to be given every few hours. Learning all of their names was not the hardest part, although it seemed the most frustrating. The most difficult of it all was certainly keeping our patience. Winston Churchill once said, “When you are going through hell, keep going.” We felt that this was the motto of our week, and that if we stuck to it there would indeed be an end to the madness. In the afternoon, I once tried to take a nap, but soon discovered that this was much easier dreamed about than done. With each dog vying for a spot where they would be curled up next to me, I was shortly jilted from my efforts to rest. As each day progressed to the inevitable dimness of evening, I wondered just when it was that my parents had lost their minds, and what, if anything, I could do to help them find their sanity once more. As I pondered this question, we dove into evening chores. Before putting the dogs to bed, we would retreat to the sanctity of the almost tranquil back porch. And, at the end of the day it finally hit me: this was all worth it. I looked up from my spot on the hanging porch swing, and I saw Charlie digging up his dirt. I remembered how many times Mom had called me after he got Kennel Cough, and how worried she was. I remember her telling me how heartbroken Daddy was, and how the vet wasn’t sure that Charlie was going to make it. I knew that Charlie was one of his favorites, and that if they lost Charlie from this disease, it would hurt him deeply. Daddy pulls each little critter that he loves into a special place in his heart. This place holds them forever, with all the heartache and happiness that they experience together. I have seen him lose a friend that was given to him in the form of a dog, and I have felt that same pain in my life. I knew the devastation it would cause, so I hoped and prayed that Charlie would recover. And here I was, at the end of the day, watching Charlie dig the dirt from one end of the flower bed to the other, only to move it back once again. He had recovered to regain his old pizzazz, and I couldn’t help but grin at the serenity of it all. I finally saw that my parents had indeed found a happiness that is extremely rare and certainly unique. At the end of the day, I envied them their joy. Our daughter, Jessica, wrote this in 2003 after taking on our sanctuary for a full week; allowing her father and I to take a much needed vacation.